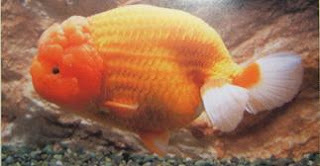 The Ranchu is the Japanese variant of goldfish bred from the Lionhead. It is not difficult to characterize this particular goldfish, as it can be easily identifiable by its short, round body with thick fins. Perhaps if you observe carefully you will notice that one of the most prominent features is the lack of dorsal fin. The tail can be made up of 4 lobes and is very short in length. Ranchu rarely grows beyond 15cm measured from head to end of tail fin. Similar like its lionhead cousin, it has a hood on its head, which looks like a raspberry outgrowth protruding from the skin. The goldfish is also known for its colorful feature and is usually found in red, orange or white striking combinations. Ranchu is a highly prized and sought after goldfish not only in Japan but also other parts of the world including America and Europe. In fact, the Japanese are so fond of it and competitions were organized during autumn each year to select the best fish. The art of judging and selecting the best Ranchu comes from the few basic concepts outlined below. No doubt with its elegant and unique characteristics, Ranchu has always remained to be one of the most popular goldfish. In Japan, this hobby is highly revered upon and refined to perfection. It is one of the most beautiful goldfish, which remains one of my favorite besides the pearlscale.